As already mentioned Trillium is among my favorite of all genera. Although I currently reside in a rental property, my landlord simply does not care what happens to the yard (as evidence by at least a decade of neglect before we moved in). So, I have turned portions of the yard into "holding" areas for some of the plants I have been collecting and cultivating in pots since becoming a graduate student. This yard is quite shady and ideal for all of my favorite plants. I have planted a large part of my Trillium collection here, and in their second season, they are starting to re-attain their stature. 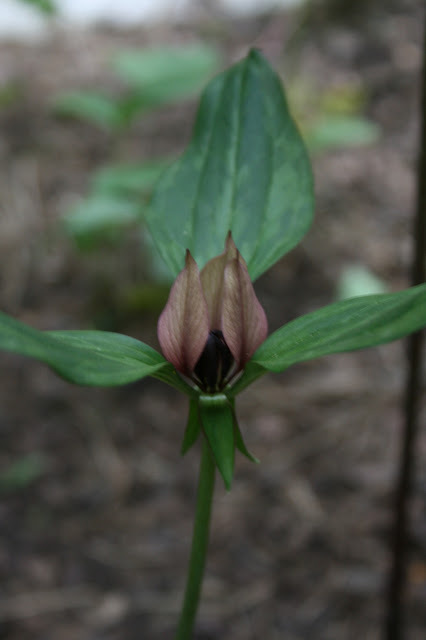 Trillium recurvatum is a very rare plant in Ohio; it occurs only in a few western counties. As you begin to move into Indiana and Illinois this species becomes quite common. I first encountered this species in central Indiana, although I did not intend to. I was invited to the area to give a lecture on new, useful, rare, and unusual plants north of Indianapolis, and when I pulled into the hotel parking to where I was staying, I noticed a remnant woodlot on the grounds with a bit of Dicentra cucullaria growing at the perimeter. Upon entering the woods, several species of choice spring ephemerals could found. So quite, unexpectedly, I found my first plants of Trillium recurvatum. I enquired with the front desk and they granted me permission to collect a few rhizomes. They thought it was funny that I was interested in collecting and preserving their local "weeds". I consider this the typical form of T. recurvatum. These plants are vigorous and easy to grow. While not the sexiest of Trilliums, it is a garden stalwart. What's even better is that the Europeans report difficulty in growing this species. Since they can grow most other temperate plants to perfection, I am quite pleased to report that this species grows with almost no care other than the occasional watering and fertilization. This is a form of Trillium simile that is starting to come into it's own. This is a form sent to me from a friend in South Carolina. I have crossed this with a form of Trillium sulcatum from Kentucky. 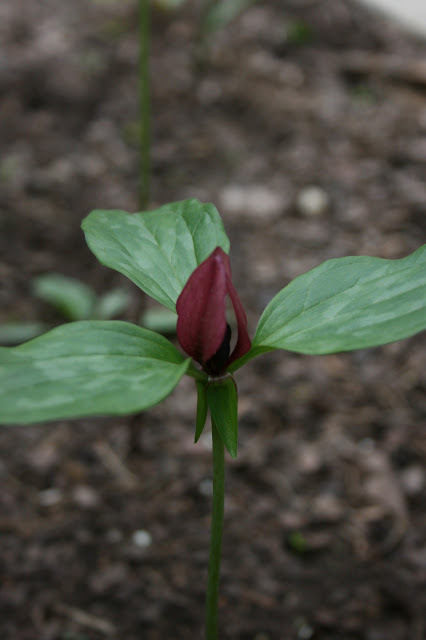 Trillium discolor is very rare in the wild and in gardens. These plants are easy to grow, but do prefer a soil that is neutral or slightly acidic. The slugs seem to love this species more than others (as you can see from the tattered foliage). A portrait of Trillium discolor growing in the wild. One of my favorites. Obviously this is not a Trillium. This is Cyclamen repandum (both ssp. repandum and ssp. peloponnesiacum var. peloponnesiacum mixed together) growing in my front yard in a very protected spot. I was not expecting these to flower this year but was pleasantly surprised. Hopefully the exceedingly mild winter helped them get established and they will live for years to come. The typical form of this species (C. repandum ssp. repandum) seems more vigorous under my conditions. The metal wire is used to keep marauding chipmunks at bay.